So, what can be said about this disaster that hasn’t been said already? I’m honestly not sure, but I’ll see if I can’t cobble something together. My brain’s still seeping out through my nose, though. I hear that’s a common symptom which follows exposure to this very “special” Holiday Special. Sorta like opening the Ark of the Covenant only worse because you have to stare at the unfathomable horror for 96 minutes. What’s the plot? Chewie’s Original Trilogy Extended Universe family wants him to come home for Kashyyk’s most important holiday of the year, Life Day. It’s sorta like a vague amalgamation of Christmas, Chanukah, Kwanza and every other winter holiday minorities celebrate. However, Chewie is having a hard time getting to Kashyyk because the Empire is chasing him and Han all over the galaxy. The bulk of the feature-length Special revolves around Chewie’s treehouse-dwelling family; his wife, Malla, his son, Lumpy, and his geriatric father, Itchy. Sound like rejects from a Hanna Barbara cartoon, don’t they? In-between the soap opera that is Chewie’s Family, you are treated (???) to a collection of bizarre shorts and even MORE bizarre celebrity cameos. Possibly the most famous of these celebrity cameos is the sequence in which Bea Arthur works the Mos Eisly Tavern and breaks-out into a song and dance, all to the tune of the Cantina Band’s song from A New Hope. But of course, the tempo is slowed a down a notch or two so she can keep up. It is quite painful. You also get to enjoy a holographic music video by Jefferson Starship. It is VERY painful. You might wanna look that one up, kids. The cast from the first film is there. You’ve got Carrie Fisher, stoned out of her gourd, Harrison Ford, intensely pissed he’s having anything to do with this project, Mark Hamill, with a face covered in so much make-up he might very well be Scott Baio in disguise, both of those annoying Droids, Chewbacca, obviously, and James Earl Jones dubbing over some stock footage with two lines of dialogue. I suppose the most entertaining portion of the Special, and the reason most people seek this atrocity out, is the animated segment. The story of the cartoon is pretty predictable, its length is short, and the animation (though decent) makes the characters all look like disfigured caricatures of the actual actors. So what makes this cartoon so important? It is the very first appearance of the ever-popular Boba Fett. Yes, even predating his more official first appearance in the Empire Strikes Back. Basically, Han is poisoned by some radiation and Chewie lands the Millenium Falcon on a hostile swamp and waits for Luke and the Droids to come help him. Luke shows up but they’re swiftly attacked by some brontosauruses. And then, big surprise, they’re rescued by Boba Fett! Boba Fett pretends to be their buddy and takes Luke to a nearby town for the antidote. However, Boba’s true intentions are to turn all of the cast over to Darth Vader for the bounty. If it weren’t for Boba Fett’s presence the cartoon would be just as unbearable as the rest of the Special. The cartoon actually looks like it was directed by Ralph Bakshi…just with none of the commentary or intellectual layers. The rest of the movie involves short comedy (???) segments, like Malla watching an alien cooking show starring some stand-up comic who obviously didn’t withstand the test of time because I’ve never heard of him, while we wait and wait and WAIT for Han to get Chewie back to his freakin’ family so the Special can just END. Eventually, they do. And in the only real action sequence in the whole Special, Han and Chewie ‘rassle with a single Storm Trooper and he trips and falls out of the treehouse. Oh the intensity. But it doesn’t end there! Oh no, we haven’t suffered enough yet. Chewie and his family then celebrate Life Day by holding hands in a séance which, apparently, teleports them to another dimension (and dresses them in robes, too) where they meet up with all the other Wookies on Kashyyk and, strangely, the rest of the cast of Star Wars. This “other dimension”, by the way, appears to be some sort of cave. And before it can all be over, Carrie Fisher serenades us with a lovely melody about peace on Earth, all to the tune of John Williams’ classic Star Wars theme. Yes, THAT Star Wars theme. And following that, we finally get to the best part of the Special; the credits. This all may seem rather pointless, and I suppose it is. 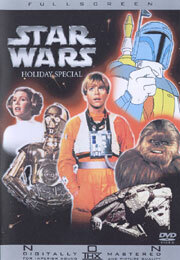 Anybody who actually has the drive to track-down and view a copy of the fabled Star Wars Holiday Special MUST know that it’s an utter machete to the face. I sure did. But like everyone else who watches it for the first time, I underestimated just how BAD it really was. And I guess there is no way to convey in words the level of pain this will inflict upon all those who see it. You just have to watch it for yourself to understand. I give it an F to end all Fs. The only redeeming value this installment in the Obsolete Extended Universe has is that it makes The Phantom Menace look like a work of utter brilliance. Love your site by the way 🙂 I subscribe via RSS. I just liked how sincere Han was at the end.